I finally have two images on silk which I am nearly satisfied with! Here is Boachu with the golden phoenix wearing the hundred family coat, the coat made from pieces of clothing from the people of a hundred households in the village. He has just climbed out of the river the demons froze. The Hundred family coat kept him and the golden phoenix warm. Now he is at a fork in the road. The right hand one is paved and leads--apparently--to a warm friendly village. The other is narrow and rough and leads into the mountains. Which will he chose? The other image is the lovers Shiwa and Humei, walking by West Lake in Hangzhou in the moonlight. Their story is coming. This image is from a Chinese story of how the sun was rescued. It seems that the sun went missing, and it was always dark. One man set out to find the sun, but he perished in the process. 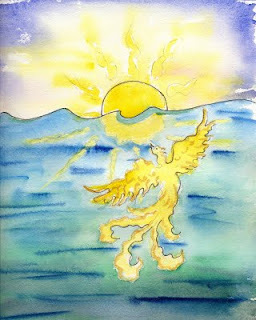 His son, Boachu, then went, accompanied by a golden phoenix. They had many adventures on the way. In one village, the people wanted to help Boachu, but they were very poor. Each household donated a small piece of their own clothing, which they made into a coat, the Hundred Family Coat. Another village had only dirt to give Boachu, so he filled his pockets with dirt. Boachu and the phoenix climbed many mountains, forded many rivers. Demons froze over one river, but the hundred family coat kept them warm. At one point, they came to a fork in the path. An old woman told them they should take the path to the right, and they would find a warm welcome, food and shelter. Boachu started to follow the old woman, but the phoenix hit him with her wing to let him know that was the wrong way. Boachu ignored her, and followed the path to the village, where he did indeed find a warm welcome and lots of good food. But as he was about to take a bite, the phoenix dropped a shoe in his soup. Boachu saw that it was his father’s shoe, and he realized that these were demons and that they had killed his father. Boachu and the phoenix escaped and continued on. At last they came to the sea. Then Boachu threw the dirt from his pocket into the water, and the dirt became islands so that they could cross the sea to where a Sea Dragon King had imprisoned the sun. This one is a bit rough. It's a smaller, test version of an image I am doing from the story of Humei and Shiwa, lovers who turned into birds. I haven't even steamed it and washed out the resist yet. 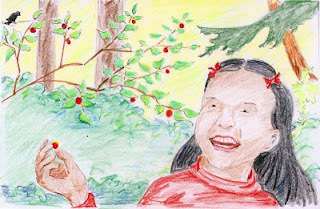 I've been thinking about stories, about why I am doing these images from Chinese stories. I think it is because the stories explain to me something about Chinese thought, and they touch our own needs. All stories are teaching stories, often speaking to a part of us that has no words, even when we are not conscious of the lesson. Some stories are born of our adolescence and teach concepts we may outgrow as we grow wiser. I'm thinking of the many many stories, movies, shows, etc, in western culture where the hero wins by might. Might makes right. Conflicts are solved with a gun or a fist. These stories have always troubled me, and I have wanted to counter them. The images I chose to illustrate are places where these Chinese stories speak to me, and I believe they may speak to others as well. Nov 23 --The black resist holds a fairly good line, as does the gold; I am still having trouble with the clear. It doesn't come out evenly, and it spreads so that the line you see when it first lays on the fabric gets much wider. In this case it picked up the marker on the line drawing below the silk. Nov 30--The black and gold resists looked good--but they did not hold up as resists at all! They worked well on two previous pieces, but when I applied dye on this one, it went right through the line!! The gold bird now has splotches of red and green, and the dark blue of the "Hundred Family Coat" bled right through into the fields and pathway the boy is standing on! The only thing I can figure is that it was cooler the day I put it on, and that meant the resist didn't go through the cloth but sat on top. I am using a heavy silk....can't remember the name right off...19 mm wieght...but it is the same weight cloth I used for the previous pieces. When I told a Chinese friend I was doing a series of paintings based on stories I learned while visiting in China, she asked if I was going to do the illustrations in Chinese style. I told her no, I am not Chinese. I can only do the illustrations as I see them through my own western eyes. My purpose is to share my experience of China through my silk painting, not to copy Chinese art. Here is the line drawing for Peacock Princess, a famous story of the Dai people in Yunnan Province in Southern China. I saw this story, which came originally from India, celebrated through dance and illustrated in stone at Xishuanbanna forest preserve just outside of Jinghong. In this scene, her husband the prince has been falsely reported killed, and the kings advisor has accused her of being a witch, saying she must die. The princess says with her husband dead, she does not want to live anyway, and asks to perform one last dance with her peacock cloak. With her cloak on, she can fly, and flies away home to her father the sun. Still exploring different resists and dyes, looking for the best match for the series I have in mind. This image is one I have been trying to express in several different media: watercolor, monoprint, colored pencil, and now silk serti painting. You can see how the resist did not hold up on the trees in the front left. I tried to fix this by painting a resist onto the silk and painting with dye on top of the resist. Not very successful, I think. I've begun re-learning silk painting, in preparation for a series of silk paintings inspired by my trip to China. This technique is called "serti" which means "fence" in French. The dye spreads across the silk until stopped by a resist (the fence). I spent August in China, mostly in the town of Huzhou, with my brother Steve Watkins and his wife Xiao Ning. Except for Steve and one glimpse of another English teacher at the University where Steve teaches, I was the only European I saw in this towm of 300,000. I felt so priveleged to have Xiao Ning and Steve to interpret the language and culture for me! Steve has been immersed in Chinese culture and language since his college days. His wife Xiao Ning was a teenager during the cultural revolution and spent her working life as a reporter for television in Yunnan Province. I did about 70-80 sketches and scribbles and a few quick watercolors , took about 1000 pictures, and took lots of notes as well. One of the highlights of the trip was a visit to West Lake in Hangzhou, a beautiful and famous lake treasured by the Chinese. 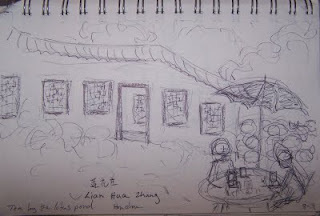 I collected stories from around the lake, and from Steve and Xiao Ning. I feel that I was given so much on this trip; I want to share some of it with you. Here, I will share some of my sketches and occasional photos along with some of my adventures. 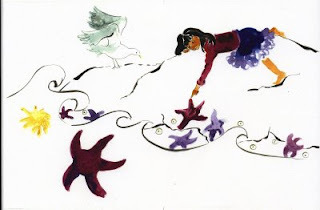 I am working on a series of silk paintings illustrating some of my favorite stories as well. These will be shown at the Tea Shop on Vashon in February, and with that, I will be showing some slides and giving a talk on February 21st, Sunday afternoon. We will be serving Dragon Well tea and a New Year's treat. Bing Im, owner of the Tea Shop, and I would love to have you come. The cost will be $10, and seating is limited to 20, so look for tickets to go on sale right after Christmas. Dragons have always intrigued me, ever since the Dragons I met in Ursula Le Guin's Earthsea Trilogy and in Ann McCaffry's Dragons of Pern series gave me as sense of Dragons as far more complex than the greedy destructive dragons of European tradition. As I studied dragon mythology around the world, I began to appreciate Dragons as deeply symbolic of ancient wisdom, creativity, and power. As I became more powerful in my own life, my relationship to Dragons changed. As a single mom, I worked to overcome poverty and to finish my college education (is education ever finished? 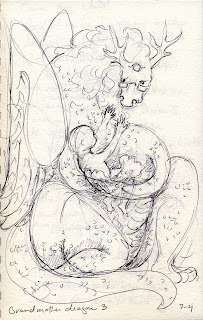 ); I adopted Dragon riding as a symbol of my own conquest of fear and adversity. I formed DragonRider Press to publish my first children's book, Atom's Monster. Now, once again, I am redefining myself and my life. Once again, my relationship to Dragons is changing. I am claiming my own power, wisdom, and creativity. Now I AM the dragon. Marjorie Watkins and I have started visiting schools with the Rotaida books. Rotaida is a fictional character who lived in Charlemage's time, in 800 A.D. Marj (on the left) and I created costumes of the period and dyed them with onion skins and tumeric to imitate as close as possible the dyes that would have been available then. Marj wrote the books, Rotaida and the Runestone, and Royal Spy, and I illustrated Royal Spy. The children were engaged and had interesting questions, as we led them back in their imaginations to a time when there were no lights but fire, no grocery stores, cell phones, Ipods, cars, or even bathrooms! One girl thought she couldn't live without her cell phone, but her classmates reminded her that she would be just fine because if she lived back then, she wouldn't even know what a cell phone was! Some of the children thought a dugout was related to baseball, rather than a type of boat, even in the context. This is an image I did for a story about a little boy confronting monsters in his room. I created the story for my 4 year old son, who was having nightmares, as so many 4 year old boys do. Here are two characters from Royal Spy. 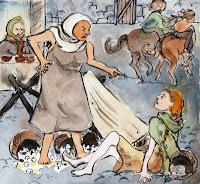 On the left is Morag, the old Saxon Hag who seeks to capture Rotaida. She wears the rune Hag, for old wise woman or witch. On the right is princess Rotaida, who has been assigned to spy on Morag. She wears Algiz, the rune of protection. 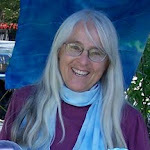 Here are some images for the web site for the Rotaida books, marjwatkins.com. 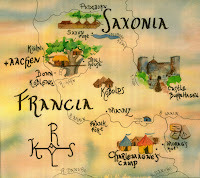 The map shows the old names for the places where the action happens. The woman scolding the girl is a scene from Rotaida and the Runestone. Here are "As a dandelion" and "I am purple", in their latest versions. The whole book may go through another illustration revision after a very helpful critique from Nina Laden. She suggested loosening up, not trying to include literal representations of children of different races, but to look at the manuscript more as a child might see it. Keep your eyes open for the next incarnation of I Am Orange--or maybe it will be called I Am Purple. 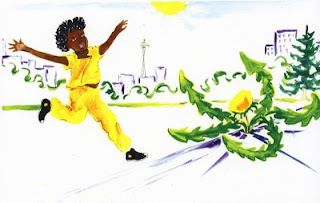 These are sketches of illustrations for a picture book by Amelia Powers, with a working title of "I am Orange", or "People of Color". 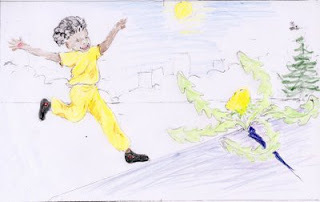 On the left is a thumbnail for one of the pages, "I am yellow as a tiny dandelion, cracking the cement to reach for the sun". 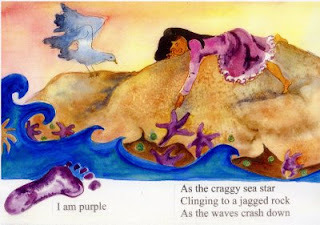 On the top is for the page "I am red as the ripening huckleberry..."
This is my favorite, a finished illustration for the page, "I am purple..."